If you ever attend a Filipino get-together one of the dishes you can count on being served is pancit. This is the Filipino word for noodles and there are several ways they can be prepared. Pancit bihon or pancit guisado (as it’s referred to in my family) is one of the easiest preparations. 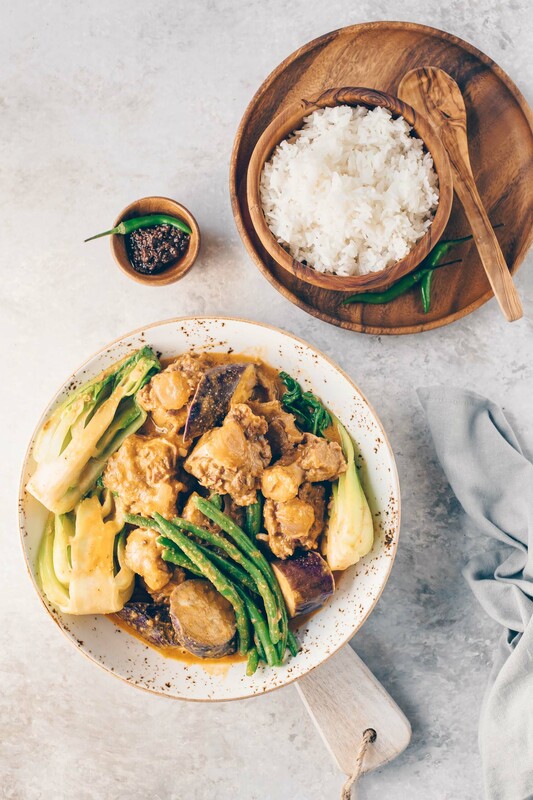 As its name suggests (guisado means sautéed and bihon is the type of noodle used) pancit guisado is simply a mixture of sautéed vegetables, meat and noodles that are tossed together. 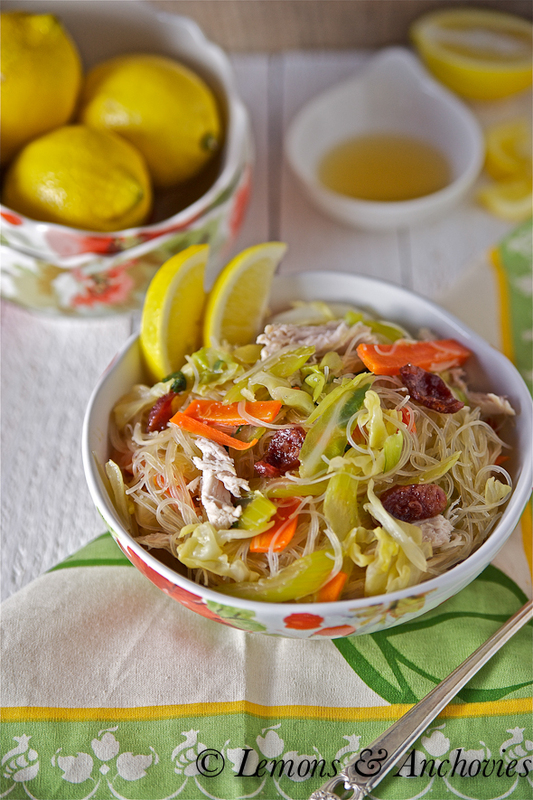 But as basic as it sounds, pancit is a favorite among many Filipinos. It never fails to satisfy…it’s comfort food. I don’t cook a lot of Filipino food (I only know how to prepare the dishes in family-size portions; too much for a household of 2) but when I do it’s because the cravings are really strong. I cooked a batch of pancit bihon this afternoon and even though I served broiled seabass and stir-fried vegetables for dinner, the noodles are all I wanted to eat. It’s always the case when this type of fare is available–I can’t ever get enough. But who’s complaining? Certainly not me. This is my kind of good eats. I prefer chicken in my pancit but others use ground meat, pork and/or shrimp. I like my version loaded with veggies but feel free to use the smaller quantities indicated in the recipe below. You can soak the noodles in water but I do what my mother does and I soak in stock to allow the noodles to absorb more flavor. I like to poach the chicken but you can save a few steps by cutting the chicken breast in bite-size pieces and cooking them before you add the vegetables to the pan. Chinese sausage is completely optional here but I happened to have some available and it does add another layer of flavor to the dish. To save even another step, you can add the stock to the vegetables after they’re cooked, then the soy sauce then the noodles. The noodles will soften as they sit in the liquid but I like to take the extra step of soaking the noodles in the stock separately to keep the vegetables from getting too limp. Your choice. It’s no accident that I have a lot of lemons surrounding my bowl of noodles–freshly squeezed lemon (or calamansi) juice is a must for pancit. No Filipino celebration would be complete without noodles and pancit bihon is always a favorite. To prepare the chicken, bring the stock to a boil in a medium saucepan. Once it comes to a boil, add the chicken breast to the stock, reduce heat to a simmer and poach the chicken until cooked through, about 12-15 minutes depending on the thickness of the chicken. Remove the cooked chicken breast from the stock (save the stock) and allow it to cool a few minutes before shredding. Set aside. In a large skillet or stock pot, heat the oil over medium heat. Add the minced garlic and cook until fragrant, under a minute. Then add all the vegetables and stir-fry over high heat for 3-4 minutes until crisp-tender. Turn off the heat, remove the vegetables from the pan and set aside. Transfer the stock to the same pan that you cooked the vegetables in. Add the rice noodles and soak them in the stock for 5-6 minutes, until they're soft. After this time there will be some liquid left in the pan. Turn the heat on to medium-high. Add the soy sauce (and fish sauce if using), vegetables and chinese sausage (if using) and toss for a minute or two making sure all the components are combined. Don't worry if the noodles look a bit wet. They will absorb all the remaining liquid in a matter or minutes. Plate and serve warm with lemon wedges and additional soy or fish sauce. I love bihon noodles and my mom used to make stir fried noodles with them. I haven’t actually made one myself. I need to go to Asian market to find bihon next time! This looks light and delicious – I especially love that you put lots of healthy ingredients in it! Very healthy and extremely scrumptious looking! The kind of food I love. This dish is so pretty, it will brighten up those murky and dark winter days for sure! Love it loaded with veggies! Such a pretty stir-fry, and I love that you went heavy on the veggies – I can never get enough! This looks bright and comforting for a chilly January evening! Jean – such a beautiful stir fry! I sure wish I had a bowl of this delight in front of me right now. You make it look so easy – perhaps I need to make this for hubby soon!!! Happy New Year!! Goodness, that looks amazing! 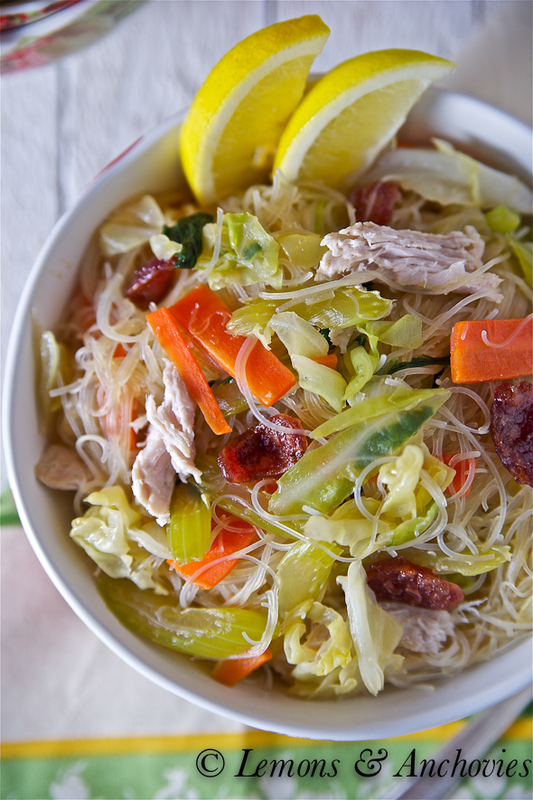 I like your Mother’s idea about soaking the noodles in broth… that’s an awesome tip! Oh, that looks wonderful Jean…and I just adore rice noodles! I want some! Pancit and lumpia are my favorite Filipino foods and what I miss most about the Filipino parties I used to attend in Hawaii. I’ll just have to make it myself – it’s basically like yakisoba, but lighter, because of the rice noodles. I’m going to use your mother’s tip about soaking the noodles, too. Happy New Year, Jean! This bowl of noodles looks delicious and comforting. I’ve never had this kind of food but I know I would love it. I have never had this before, but it sounds like sometime I would really enjoy! Looks delicious! So beautiful and colorful! This would definitely brighten up a gloomy winter day! This is one of the Filipino dishes that my kids and husband eat a lot. The veggies of course picked out by the kids. 🙂 I recently made some but I couldn’t find regular cabbage, just the puple one. It came out colorful and just strange because it’s so purple! LOL! It is truly comfort food. My sister and brother are half Filipino so I had to learn to make chicken adobo and pancit. The pancit that I usually make is Canton but the kids like your style. So now I mix the two. Any style to me this is comfort food Asian style.Yum. I think I’ll try your recipe next. This is a great recipe that reminds me of countless meals at my best friend’s house growing up. Soaking the noodles in the chicken stock is the secret. It tasted really authentic! I didn’t have fish sauce so used oyster sauce and it worked. Also threw in a handful of canton noodles, like my friends do. Thanks! Thank you for the tips and recipe. Everytime I’ve ever tried to make pansit, something goes wrong and never comes out right. This made it easy and turned out great.